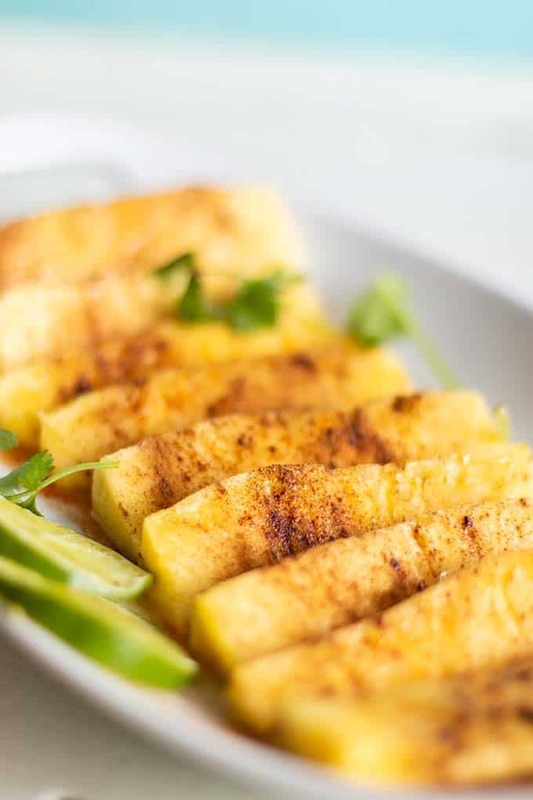 Mix up your summer BBQ with this easy Sweet and Spicy Grilled Pineapple with Cinnamon. 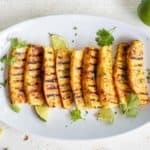 This easy grilled pineapple side dish takes minutes to make and is a really special addition to any grilled meats or vegetables. 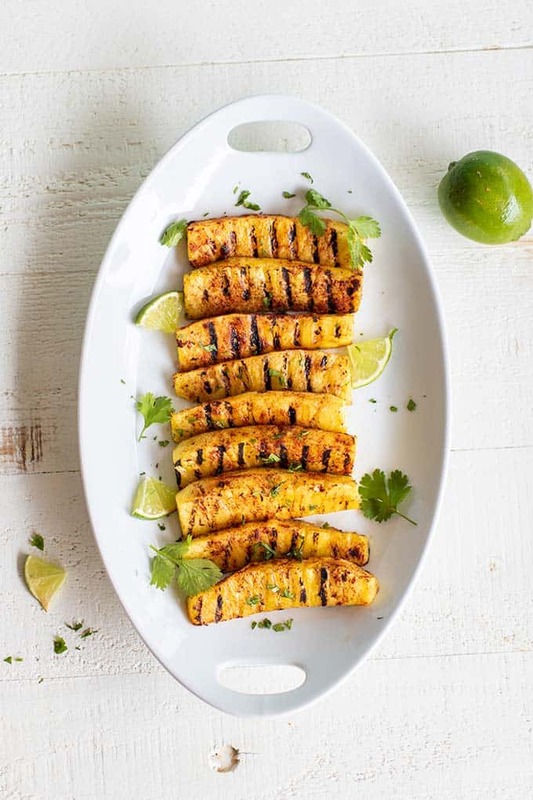 Brazilian Grilled Pineapple – A Healthier Whole30 Version! 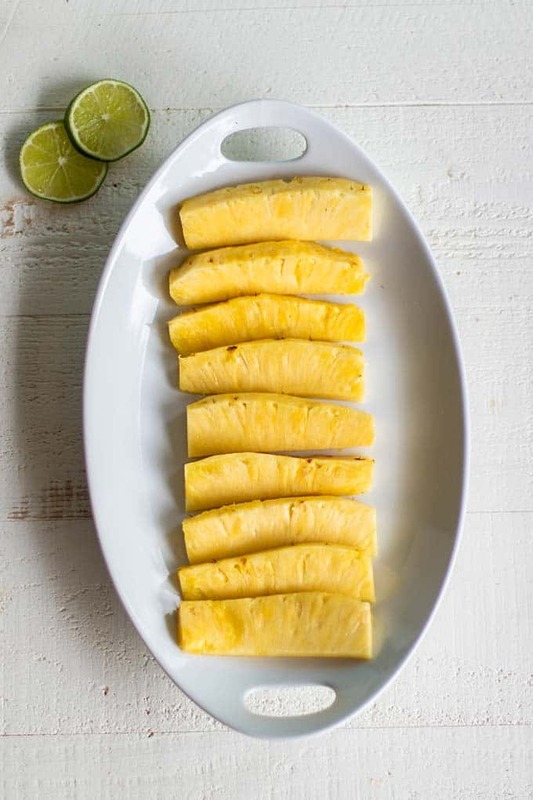 Brazillian grilled pineapple is made by coating pineapple spears in brown sugar and cinnamon, and then grilling it. Delicious? YES! But really, not necessary. Pineapple itself is sweet, and throwing it on the grill only intensifies its natural sugars. Start this recipe with a juicy, ripe pineapple. When picking one up at the store, always smell the bottom to determine if it’s ripe. If you’d like to use it right away, you want it to smell sweet. If there is no noticeable smell, it isn’t ripe yet. 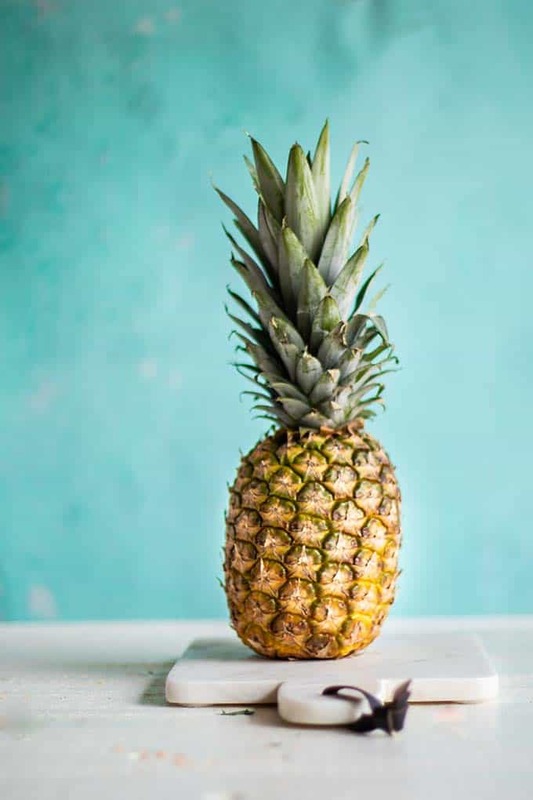 A pineapple that isn’t ripe can take up to a week to sweeten up. 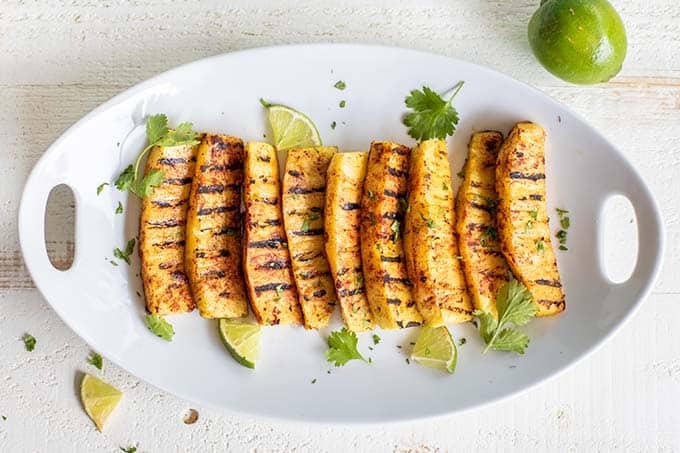 This healthy grilled pineapple recipe combines a unique combination of flavors — sesame oil, chili sauce (like Frank’s Red Hot original or Cholula. Sriracha is good if you aren’t on the Whole30), lime juice, and a sweet sprinkling of cinnamon. You don’t have to be on the Whole30 to appreciate this sweet and spicy blend! Making this recipe is as easy as cutting the pineapple, brushing it with the sesame oil blend, and then sprinkling it with cinnamon. Throw it on the grill last and turn up the heat if needed – it’s so good when it’s still hot off the grill! I love serving grilled pineapple at gatherings for 2 reasons. One, it’s special and unexpected at a BBQ, so everyone is always thrilled to see it. Two, it takes minutes to prepare, great when you’re busy doing tons of other things. Pineapple doesn’t take long to grill. It will soften if grilled too long, so I like to make sure the grill is very hot before I put it on. Once it’s seasoned, just add it to a very hot grill until grill marks appear (about 3-4 minutes per side). If you’d like to make this recipe indoors, you can broil the pineapple on a baking sheet for about 4 minutes per side. Just enough to get a little color across the tops! 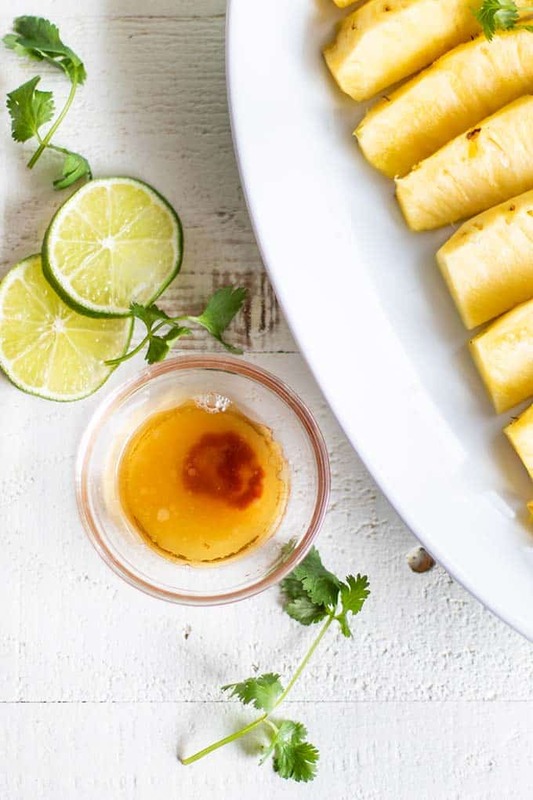 This easy grilled pineapple recipe is taken up a notch with a spicy and tangy blend of sesame oil, hot sauce, and lime juice. Sprinkle it with cinnamon and grill it for a few minutes for an easy and healthy side dish. In a small dish, mix together sesame oil, lime juice, and hot sauce. Brush the pineapple with the mixture. Sprinkle both sides of the pineapple with cinnamon. 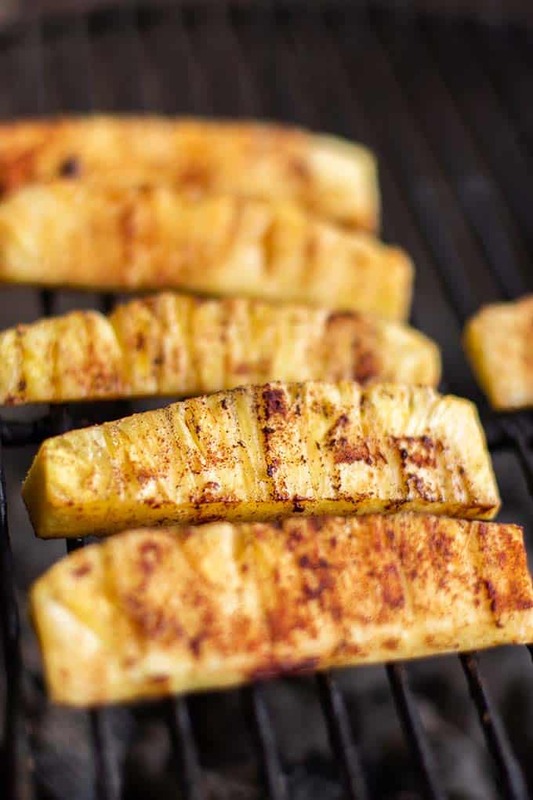 On a very hot grill, grill pineapple wedges for 3-4 minutes on each side, just long enough to get a little color. Squeeze fresh lime on top and garnish with cilantro. * To make this recipe indoors, cook pineapple on a baking tray under broil for about 4 minutes per side. This Grilled Pineapple with Cinnamon post may contain affiliate links, meaning if you make a purchase, I will receive part of the sale as a comission. This helps me continue to bring you lots of fresh and inspired recipes!